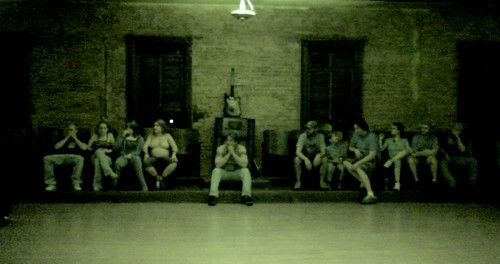 The Crowd at the Lost Ballroom, originally uploaded by Anthony Topper. I took this picture with a video camcorder, a Sony DCR-SR100. I had forgotten the compact flash card for my Canon Digital SLR. I was using the “Nightshot” mode, which makes the photo super grainy. I used filtering to blur away some of the graininess with Picasa. I liked the composition among other things.